Simply put, rather than reinventing the wheel, entrepreneurs need to find the wheel-maker, and leverage the wheel-maker's expertise and experience. There are four key practices to embed this into the enterprise. First, build a network before it's needed. I'm convinced that the single most important asset any entrepreneur can build is their Rolodex. Today's obsession with innovation is causing as many problems for entrepreneurs as it solves. And it's definitely not the only way to solve challenges or build a thriving enterprise. When I was a boy, I remember my father having a massive collection of neckties. There must have been over a hundred of them, their knots slacked off, not quite undone, all draped around a single hanger in his closet. There were wide ones and narrow ones; bright, garish ones, and dark, conservative ones; silk ones and cotton ones; with ends that came to a point, or stopped short in a square. My favourite was a wide, green silk one, patterned with white rings that looked like Polo Mints. When my sister and I asked if he would ever wear that again, dad's answer was always the same: "Just wait. It will come back into fashion." I don't think that particular one ever did, but the broader point remains: 'everything old is new again.' It's a lesson too easily lost on today's innovation acolytes. We've got 'technology innovation,' 'process innovation,' 'social innovation,' and more. We've got books about innovation, courses on innovation, and awards for innovation. We've even got typologies of innovation! Ironically, many of these aren't innovative at all. They're just focused applications of brainstorming, or new combinations of existing successful ideas. Sure, new combinations or applications can be 'innovative,' but this isn't about semantics. It's about an obsession with innovation that's driving too many business page headlines and that has become the focus of too many entrepreneurs. A lack of innovation does not equate to an excess of complacency. With all due respect to Albert Einstein, many modern challenges really can be solved at the level of thinking that created them. Yet all too often, entrepreneurs, 'accelerators,' venture capitalists and consultants are more excited about taking new approaches than they are in solving the problem at hand. Perhaps enterprises should be focused on execution -- on getting things done! -- rather than spending time working on new approaches? "Ideas are cheap. Execution and results are everything." So where else might we turn? What other approaches can we take to entrenched or vexing challenges that may drive positive results, or at least some measurable progress? What other frameworks might entrepreneurs consider in order to advance their enterprises and achieve their missions? Ilana Labow is a Vancouver-based social entrepreneur and food systems activist. Jewish by heritage, Ilana recently described to me the practice of 'shmita.' Most literally translated as 'release,' shmita happens once every seven years. "Of biblical origin, this is the final year of a shared calendar cycle, when land is left fallow, debts are forgiven, and a host of other agricultural and economic adjustments are made." In other words, it's a cultural reset button, pressed every seven years, "to ensure the maintenance of an equitable, just, and healthy society." Communities must plan for shmita for six years, in order to have the reserves, the savings, to live for the seventh year--a period when all fields are left to replenish, and people are left free to focus on other pursuits--learning, traveling, playing, and more. Over the thousands of years of recorded human history, we've collectively forgotten countless practices that solve some or all of the problems we face today. To focus only on new innovations is to ignore the lessons of history. Wisdom is embedded in enterprises through organizational culture. The establishment of norms around transparency across teams, and oral histories shared from one group of employees to the next cultivate the trust that's prerequisite to candid, open dialogue in the workplace. Part of each leader's role in organizations is to exemplify the openness, trust and sharing that's essential to building, preserving and sharing organizational wisdom. 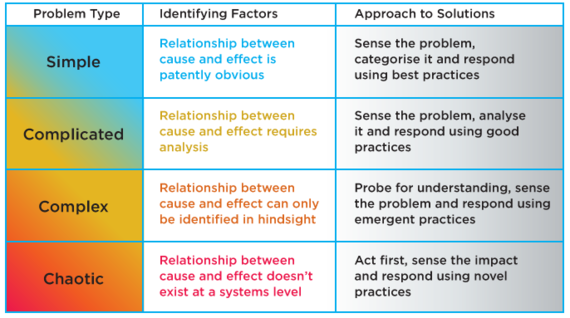 In truly complex problems (see table), solutions can be impossible to discern until they're discovered through experimentation and rapid application. But most of the problems entrepreneurs face are merely complicated. These can be solved by the direct application of best practices. This is not innovation; it's effective application of lessons already learned. 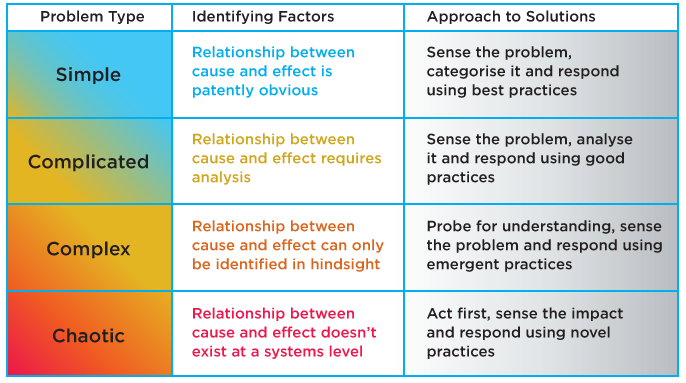 Solving complicated problems requires a recognition and understanding of the challenge, and then an analysis of the best practices to apply to resolve the challenge. The hardest part for entrepreneurs is gathering the appropriate expertise, if they don't have it in-house. Simply put, rather than reinventing the wheel, entrepreneurs need to find the wheel-maker, and leverage the wheel-maker's expertise and experience. There are four key practices to embed this into the enterprise. First, build a network before it's needed. I'm convinced that the single most important asset any entrepreneur can build is their Rolodex. A diverse, accessible network can be engaged to find all kinds of wheel-makers. It's particularly important to build networks across sectors, so diverse perspectives on problems and problem solving redress any blind spots entrepreneurs or their organizations may have. Second, build the humility to ask for help. Nobody has all the answers. In the rapid-cycle context of entrepreneurship, there are always more questions. Without the humility to engage others and ask for support, entrepreneurs struggle to find answers quickly enough to make their enterprises thrive. Fourth, recognize that in many instances, buying the expertise -- by hiring experienced team members, or engaging paid consultants -- is a faster and more efficient response than trying to build the expertise. After all, the pace of business isn't slowing down! Despite the aspirations of venture capitalists and the case studies in the pages of Inc. Magazine, most enterprises are not miraculous, overnight successes. This tongue-in-cheek retort hits much closer to the truth: every overnight success is ten years in the making. The media's unrelenting coverage of radical innovation, 'disruption,' and the (small) handful of entrepreneurs that exemplify 'American Dream' breakthroughs collectively may do more damage than good. For every entrepreneurial superstar with his picture on the cover of Forbes (and sadly, there are too few 'hers'), there are 10,000 businesses working methodically, at a measured, sustainable pace, building value every day. They may never IPO, but they employ millions of people, they sustain careers for the long term, and they certainly generate the wealth that's supposed to sit at the end of the entrepreneurial rainbow. Entrepreneurial success is culturally equated today with billion dollar valuations and significant sector 'disruptions.' Yet even startup guru Steve Blank acknowledges that this is but one type of entrepreneurial venture. There are lifestyle entrepreneurs that build an enterprise to support the way of life they and their employees have chosen. Small businesses, another type of enterprise, are the bedrock of local economies, and by extension of entire nations. And intrapreneurs work inside larger organizations, generating the next business or product line. Success isn't all about innovation. And it doesn't have to come at the speed of light. In entrepreneurship, as in life, the journey counts at least as much as the destination.